Learn The Secret to Making Your Christmas Party Memorable and Huge Fun! For Your Next Kids’ Christmas Party! Click the play button below to watch a short trailer for the "Santa via Satellite" show. Need a change from the tired old format?? Want to make it the “Event Of The Year”??? My name is Joe Libby. I have been performing as a ventriloquist and comedy magician for family events in the San Antonio area for almost 30 years. This year, I have available a fun and different show that could be one of the best Christmas party ideas ever! It's ideal for schools, churches, scout packs, home parties, and anyplace else kids and families will be celebrating. to Santa’s North Pole workshop!!! Imagine if you could actually take your kids to visit Santa Claus in his home at the North Pole. Get inside his famous workshop. Talk to him while they’re watching him make toys. Check out his sleigh. They’d think that was pretty cool, huh? Will Absolutely "Knock Their Socks Off"!!! Guaranteed. The SANTA VIA SATELLITE show is hosted by San Antonio TX ventriloquist and comedy magician Joe Libby. 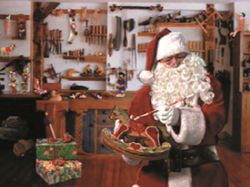 It all begins when our “live satellite TV hookup” takes us to visit Santa in his snowy North Pole workshop. We’re able to have an actual conversation with Santa in real time … HE EVEN TALKS DIRECTLY TO THE KIDS IN THE AUDIENCE! that's unlike anything ever offered before! That’s right … through the magic of technology, we’ll be checking in with Santa to chart his progress as he makes his way to visit the children at YOUR Christmas party! The first problem he encounters is with his reindeer. Some are sick, some are missing, Rudolph’s nose is frozen …! But, hey—no problem. With some magical help from the magician onstage, Santa’s sleigh becomes airborne without the reindeer. He’s on his way! The next time we check back with him, Santa’s caught in terrible snowstorm! Then he gets hopelessly lost when his map blows out of his hands! There are other problems along the way, all of which are solved through some wonderful magic. And for the sensational finale, Joe's ventriloquist puppet Sagebrush rescues Santa by making him vanish from the screen and appear onstage! Santa’s workshop … his snowy North Pole home … an airborne sleigh being buffeted about in a nasty snowstorm … these and other terrific special effects lend a “larger than life” quality to all of the TV sequences … and the live onstage ventriloquist and comedy magic performance is nothing short of outstanding! YOUR CHILDREN WILL NEVER FORGET! Ever had trouble getting kids to sit still for a half-hour show at Christmastime? This show is your solution … they’ll be glued to their seats during the magic and watching intently to see Santa’s incredible journey from the North Pole in a way they can all relate to … on TV!!! What a great idea for a Christmas party! Remember that the kids can’t wait to meet Santa. When they see and hear him onscreen, talking directly to them about his impending arrival, they’re riveted. Add the live comedy and magic show (every kid LOVES magic!) and you have a captivating experience they’ll be talking about for a long, long time. The back-and-forth mix of the interactive TV Santa with the onstage performance keeps the kids involved and interested from start to finish. The One They Rave About As Being The "Best Ever!" 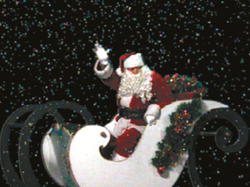 Over $20,000 in special effects and production values have gone into the creation of the “Santa via Satellite” interactive multimedia component … it truly is a one-of-a-kind presentation unlike anything else available. Santa’s amazing vanish from the satellite picture and sudden arrival onstage will have even the adults’ amazed and laughing! 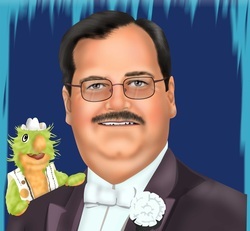 With almost 30 years experience in presenting ventriloquist-comedy magic shows for family audiences in the San Antonio area, I promise to bring a level of professionalism and quality that assures you of a top-notch performance. Guaranteed. Testimonials from satisfied clients give you the confidence in knowing that your staff and coworkers will be delighted with the results of your decision to bring my performance to your Christmas event. Ventriloquist and comedy magician Joe Libby is exclusively licensed to present "Santa via Satellite" in the San Antonio area. Meaning you will get a performance that will help make your Christmas party out of the ordinary, memorable, and a huge success. You will be thanked, get applause, and be a hero with your group for planning such a great event! This Show Sounds FANTASTIC! How Do We Reserve Our Date? Call 210-772-6686 for booking information and date availability. Or, simply fill out the e-mail contact form below. Either way, you’re urged to respond immediately, while it’s still fresh in your mind. Remember, the Christmas season is the busiest. Dates are extremely limited, and all bookings are made on a first-come, first-served basis. If you don’t want to miss out on the chance to bring this spectacular “Santa via Satellite” multimedia magic presentation to your Christmas party, you’ll take action and call or e-mail right away. You'll Get Great Results Like This Too ... Guaranteed. --Pat Walker, Eisenhauer Road Market Center, Inc. YES, JOE! 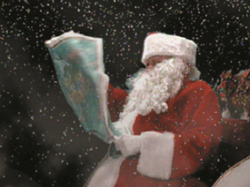 We want to have you bring "Santa via Satellite" to our next Christmas party! Please contact us with additional information on this amazing multimedia presentation. Please provide some details about your event, including the location and the time, This will better help me to help you. Thanks! !